Third party lens manufacturer, Sigma, opted to maximise image quality rather than minimise the size of its new compact system lenses according to Kazuto Yamaki, the Chief Operating Officer. Speaking exclusively to TechRadar at CES 2012, Yamaki explained that the decision to produce standard rather than pancake lenses was made because the short back-focus of these optics can compromise image quality at the corners of the frame. Sigma also chose to use a linear motor in the lenses because it allows near silent autofocusing, which is important to photographers that use their compact system camera (CSC) to shoot video. These motors have the additional benefit of allowing smoother, virtually stepless focusing movements. While linear motors are a good choice for small lenses with light elements, they are not suited for use with lenses that have heavier elements. Yamaki says that this is an issue that the company will be looking to resolve in the future, perhaps working with other manufacturers to achieve the goal. In a move designed to provide lenses that users can rely on for years, Sigma has made the mount of its new 19mm and compact system camera (CSC) lenses from brass with a coating of chrome. 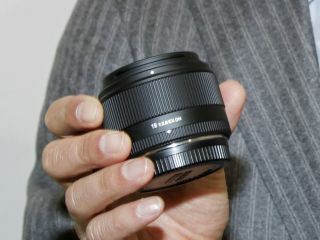 Yamaki explained that some competing manufactures use aluminium for its lens mounts. While lightweight and preferable to plastic, aluminium mounts lack the strength and longevity of brass fittings. While Sigma has decided to produce more expensive, better quality optics on this occasion, Yamaki does not rule out the company making more affordable optics or pancake and zoom lenses in the future. His aim is to meet the optics needs of a wide range of photographers. Sigma may also produce a collapsible lens in the future, though Yamaki would not be drawn on whether it would feature a mechanical design like Olympus's M.ZUIKO DIGITAL 14-42mm 1:3.5-5.6 II lens or an electronically powered construction like Panasonic's Lumix G X Vario PZ 14-42mm F3.5-5.6 OIS optic. Sigma's recently announced 19mm and 30mm lenses will be available with Micro Four Thirds (MFT) and Sony E mounts for use on Panasonic and Olympus MFT and Sony NEX compact system cameras. As these two types of camera have different sensor sizes the effective focal length of the lenses depends upon which camera they are mounted on. On a Panasonic G-series or Olympus PEN camera, the 19mm lens has an effective focal length of 38mm, while on a Sony NEX optic it is comparable with a 28.5mm lens. Meanwhile the 30mm lens produces images comparable with 60mm and 45mm optics respectively. Because Sony NEX cameras use a larger (APS-C sized) sensor than Micro Four Thirds models, Sigma has designed its new CSC lenses to suit the Sony sensor size. As Nikon has not released its technical data for its Nikon 1 mount, Sigma will not be producing compatible lenses in the forseeable future, but Mr Yamaki says that it is Sigma's mission to support as many camera manufacturers as possible.